Lets begin with the obvious—this cartoon makes no sense. I’ll start with a believer’s standpoint (though I am certainly not a believer) and then work my way back to the values of democracy. Here we are faced with the problem of religious thinking – it promotes a superstitious mindset that is prone to forgo critical thought in favor of fear mongering. Within the sphere of public school—a state run institution intended for all students of all beliefs—the state has no right to impose a specific belief system on the students. However, those students are free to express their beliefs otherwise. Under the Amendment, prayer in public school should have never existed, but it did. In 1890, Catholics were the first to take a stand because the schools performed Protestant observances. However, prayer in public school wasn’t overturned until 1962 – a case that began with Engels, a Jewish man who was upset to see his son praying incorrectly according to their faith. Keeping religion out of public school was further confused in the 1950’s. Though the pledge of allegiance was written in 1892, the words “under God” weren’t added until 1954. This was also the same era when “In God We Trust” was added to our bills. There are exactly three religions that worship God – Judaism, Christianity, and Islam. The Abrahamic God has specific attributes that don’t equate into being Brahman (the supreme deity of Hinduism). And in Buddhism, for many, there is no God at all and worship is not an aspect of the faith. Rather, enlightenment is the ultimate goal. Last but not least, there is the Secular Humanist who enjoys the realm of scientific inquiry and the sheer magnitude of nature. Forcing all of these groups to pray according to a certain faith, or to pray at all, is nothing short of fascism. I often wish that I had been allowed to attend public schools. My parents believe that I was given a superior education by being put in a private Christian school by the third grade, but I truly doubt it. Within the public school, my needs were attended to and I was recognized as a child with learning disabilities. But once in private, I was one loner in a mass of students I could never keep up with. The older I got, the more the pressure to conform became excruciating. The Bible was drummed into my brain, chapel was a continuous drone of “Lord I lift your name on high’s” and life seemed like a continual guilt trip. On top of this, I was constantly bullied and harassed. I wonder what it would have been like to be in a school where I was not told who to be and what to worship. I wonder what it would have been like to truly experience diversity at that young age. Early on I had a nice friend who was Buddhist, but after my mother picked me up at her house and saw the statue of Buddha in the foyer, I was no longer allowed to play with her. Personally, I loved my friend’s home and felt humiliated by my mom’s reaction. It wasn’t that my mom was afraid I would convert to Buddhism, it was that she considered all other faiths to be evil and demonic. I remember a sense of constant outrage in the 1980’s that prayer in school was no longer allowed. To the Christian Right, it spelled the demise of our youth. To them, things were always getting worse, not better. And still, to this day, life is not based on fact but on fabulous fictions. 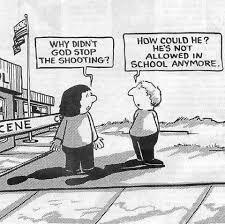 Just like this cartoon, which doesn’t even get the premise of their own religion straight. You are currently viewing the archives for October, 2015 at Lauren J. Barnhart.